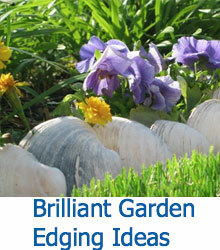 Add a nice look to your garden or yard with a little creativity. 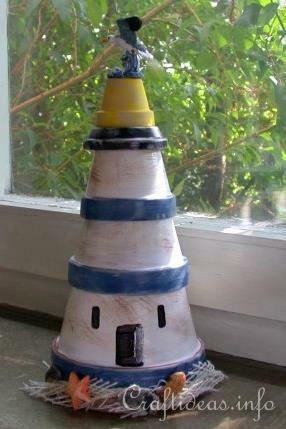 Learn how to construct any one of these Terra Cotta Lighthouses. 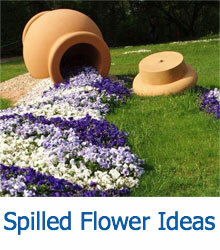 Creating a lighthouse with terra cotta flower pots is a simple and fun project for your home. This project is so simple even your kids could help you! 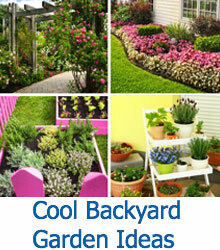 Make a tall feature for your garden or yard, or assemble a small one to use in your house. The color combinations are endless and the additions, details, and personal touches can be anything and everything – the only limit is your own creativity! Check out some of the tutorials that we have found for you to enjoy and spark your own lighthouse project design. This adorable lighthouse is so quick and easy to make! 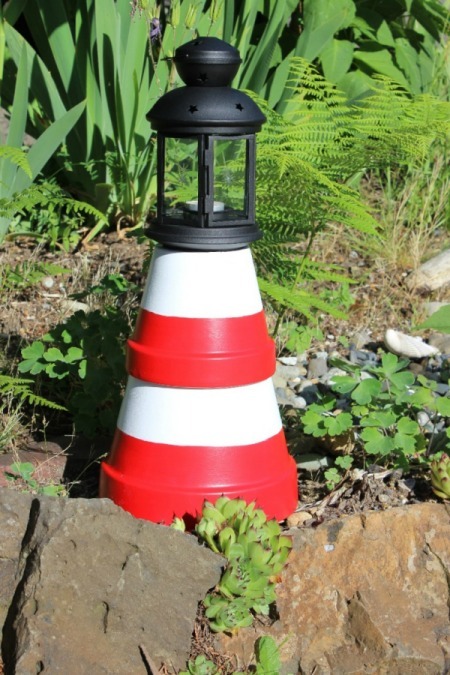 With the small candle lantern on top to look like a true lighthouse, this DIY is a cute addition to any garden. Just paint your flower pots whatever colors you want, glue them together, attach your gorgeous lantern and call it a day! To see the entire tutorial, head over to Thrifty Fun. 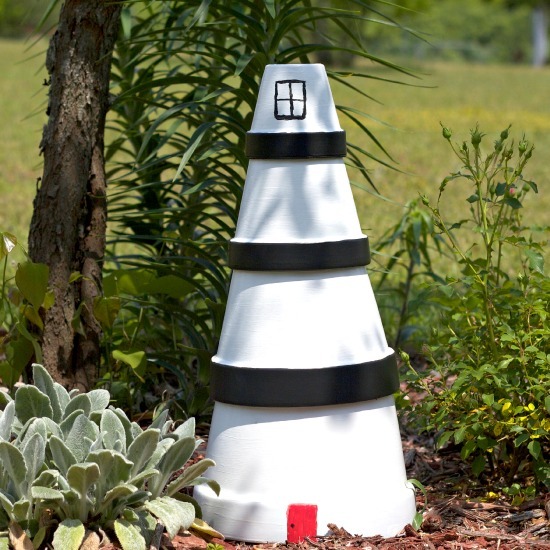 This stately lighthouse makes such a striking addition to your garden. Done in simple black and white, the little red door painted on the bottom is a cute detail and the sizes of the pots make a truly tall lighthouse. The entire tutorial can be read over at Some of This and That. In place of the lantern used in the first tutorial we featured, this one makes use of tiny flower pots and a flower pot saucer to create the lighted top of the lighthouse. Roughing up the paint gives it a more rustic and weathered look. The addition of shells and small figures give it a nice, beachy touch. You can see the tutorial over at Craft Ideas! 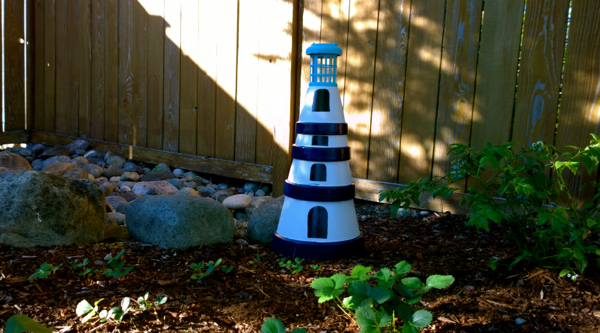 This wonderful lighthouse design utilizes some adorable details to make it an attractive addition to this garden. A simple, battery operated lantern tops this one off and creates a charming touch. A simple paint job and some glue is all you need to complete this project. All the directions can be found at Gazing In.